Watch a video from the Alabama Cattleman’s Association & Alabama FCCLA announcing the project! October is beef month in Alabama and we want you to get involved! 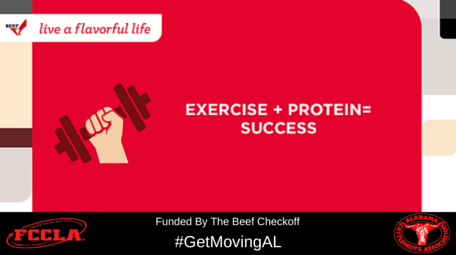 Teachers and classes are challenged to participate in the Alabama Obesity Task Force’s Get Moving Alabama campaign to make healthy choices in October and learn how beef can easily fit into these choices. Family and Consumer Science classes are challenged to submit a video and electronic portfolio of how their class or school is going to get moving in October to promote a healthy lifestyle through nutrition plans, physical activity and fun! Purpose of Project: To recognize participants who include protein rich meals in their diet, track food intake and physical activity for themselves, their family, or a community group and determine goals and strategies for improving their overall health. Participants must prepare an electronic portfolio and video. The Supertracker can be used to track your foods and physical activities (https://www.supertracker.usda.gov/). Video and electronic portfolio submissions must be made to Erin Beasley at the Alabama Cattlemen’s Association in a format suitable for uploading to social media. Winner will be selected the 2nd week of November. Click on the button below for full project details.